In order to celebrate my daughter's birthday, I finally made myself the bracelet I have been planning for months. I love it. Even my husband said he wished it wasn't just a "girlie" think because he loves it so much. The photo's don't do it justice...is that vain? Because really it is so pretty. If it had been a gift I would have cried upon opening it. 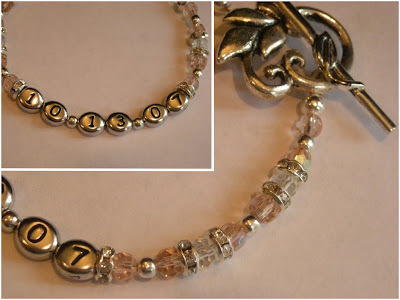 I am now offering these same types of "Memory Bracelets" in my Etsy shop...fully customizable. What is it with me getting ill every time I do a month-long-blog-a-thon? This month I only had to think about it and a cold crept up on me. It's quiet in the house now, everyone is asleep, and I have a list of 1 million things I should be doing right now, but it seems like so much better an idea to steal a few minutes to write. I don't even have a great philosophical point to make. I just miss being in this place. Writing and hearing from God. Sharing my heart and connecting with...um...anyone who might be reading. I think most of my blog readers might be friends I already know, but I like to imagine that there are a few people who stop by to share a cup of coffee now and again that I might not ever know of. So, this blog is for you I guess. Welcome. This time of year is so special to me as the air turns colder and christmas smells begin to fill the air. Today I wanted to but every autumn decoration in the craft store. I resisted and didn't buy anything. This is a season that my daughters were born in, that my husband and I met and fell in love in, that baking and sweaters abound. A season for cute boots and good memories. As much as I say I love summer most, I'm pretty sure I have an affection for autumn that is special and set apart. Soon it will be popcorn and hot cocoa to celebrate rainy days, and my oven will be going almost non-stop to warm up my house and to feed happy children.